Priced below KBB Fair Purchase Price! Aluminum Wheels*, Backup Camera *, Bluetooth *, Power Package*, Sport Package*, Gray Cloth. 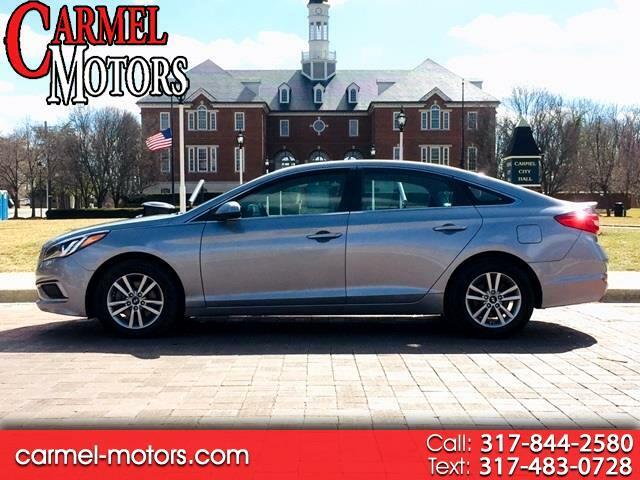 shale gray metallic 2016 Hyundai Sonata SE 185hp FWD 6-Speed Automatic with Shiftronic 2.4L I4 DGI DOHC 16V ULEV II 185hp We Offer the Best Automotive Finance and Loans for Good and Bad Credit "GUARANTEED APPROVAL". 25/38 City/Highway MPG Awards: * 2016 KBB.com 10 Most Awarded Cars * 2016 KBB.com Best Buy Awards Finalist * 2016 KBB.com 10 Best Sedans Under $25,000 * 2016 KBB.com 10 Most Comfortable Cars Under $30,000 * 2016 KBB.com 16 Best Family Cars * 2016 KBB.com 5-Year Cost to Own Awards Let Carmel Motors show you how easy it is to buy a quality used car in Carmel. We can arrange shipping to anywhere in the country at our discounted rates. We believe fair prices, superior service, and treating customers right leads to satisfied repeat buyers. SERVING ALL SURROUNDING CITIES OF CARMEL, FISHERS, WESTFIELD, MCCORDSVILLE, FORTVILLE, NEW PALESTINE, NEW CASTLE, GREENFIELD, GREENWOOD, MUNCIE, YORKTOWN, MARION, GAS CITY, SPENCER, CICERO, KOKOMO, LAFAYETTE, COLUMBUS, NASHVILLE, BROWNSBURG, AVON, BLOOMINGTON, MARTINSVILLE, BEDFORD, JASPER, WASHINGTON, EVANSVILLE, VINCENNES, GARY, CROWN POINTE, SHELBYVILLE, MERRILLVILLE, CRAWFORDSVILLE, WEST LAFAYETTE, FT WAYNE, SOUTH BEND, ELKHART, HAMMOND, RICHMOND, CINCINNATI, LOUISVILLE, CHICAGO, NASHVILLE, TENNESSEE, EDINBURGH, TERRE HAUTE, SHERATON, MONTICELLO.